The mirrors in every shot are abused by Photoshop. 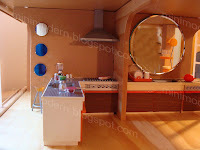 I'm not a photographer (or a great Adobe Photoshop expert either...) so I cannot take decent pictures when I use mirrors (always get my ugly head in the shot) or Plexi (can never capture its existence) in the miniature scene. 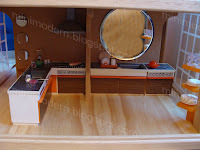 Let's see..., the kitchen set is actually two vintage 1960's or 1970's sets that I won on ebay several years ago. They may have been produced by Flairline but I'm not sure. I've seen a blue and white set similar to these. Note that I covered the orange kitchen cabinet doors with wood grain designed contact paper. 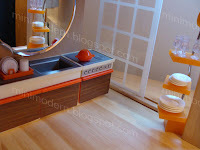 The orange shelving unit is from AG Minis, the orange stool is from Lil Bratz and the range hood is from Streets Ahead Dollhouse. The mirrors are purchases from your average craft and hobby store. All of the accessories are from Irwin, Mighty World, Re-Ment and Bodo Hennig.